“I Hate to Write” is the compelling story of Edith Agnes McCormick an Irish immigrant, a devoted mother raising three sons in New York City in the early 1900’s through WWI. Edith is an extraordinary woman of courage and fortitude. Through her “Record”…. a diary, which amazingly encompasses the period 1901 to 1919, Edith provides a compelling, extraordinarily personal glimpse into family life, but also the events occurring at the turn of the century through the cataclysmic changes of WWI. Why did I choose the title “I Hate to Write”? Because those three words begin Edith’s journal and though she may say she hates to write, she writes marvelously. For book reviews, click here. To order “I Hate to Write”, click here! We bring continued quality of life and intellectual stimulation to senior residents in independent and assisted living community environments. 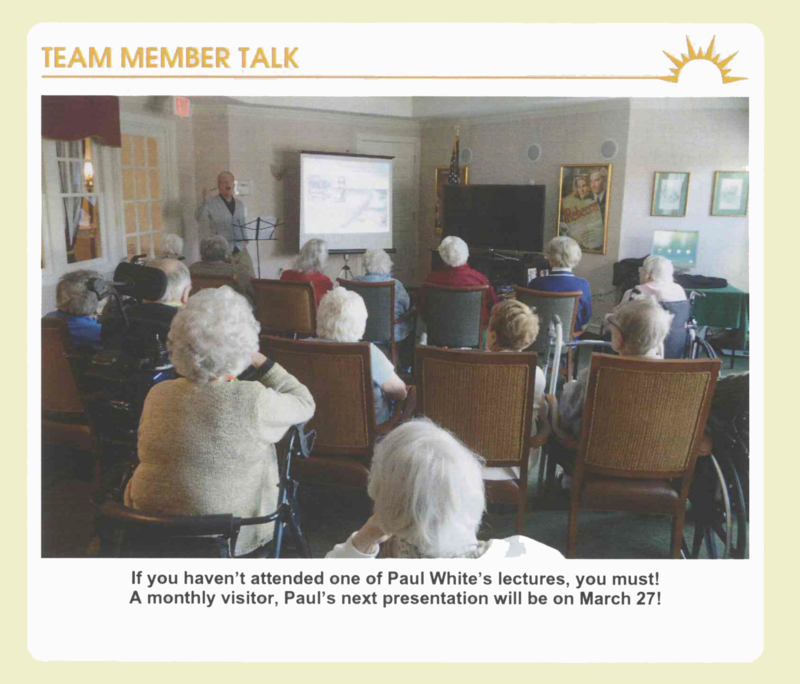 Lifelong Learning presentations are designed for seniors who have always enjoyed learning, continued education and the changing world about them, however have eyesight, ambulatory or age issues that make access to learning and intellectual stimulation difficult or impossible. Lifelong Learning presentations: HRG offers several lifelong learning interest tracks. See Historical Education – Lifelong Learning tab. For example, HRG offers interesting people as the iconic French fashion designer and business executive Coco Chanel, Inspiring Women, Broadway Plays & Musicals, American Artists, Presidential Elections, WWII, Korean War or such events as JFK and the Cuban Missile Crisis, the most dangerous 14 days in our nation’s history. “Once again Paul, an excellent presentation yesterday. Residents and co-workers thoroughly enjoyed it even those who were only able to stay for a short period of time. Thanks again – definitely one of the finest business decisions I’ve made”. HRG offers a nuanced historical and artistic look at such themes as Inspiring Women, America’s Wars, Art and Artists, Music, Entertainment, Literary, Presidents and Historical Events. HRG employs Powerpoint, interactive video, ipad technology, it’s own portable projector and screen or will connect your theatre or flat screen tv environment via HDMI. We also bring along a sense of humor! A Baptist minister, Martin Luther King, Jr. became a civil rights activist early in his career. He led the 1955 Montgomery Bus Boycott and helped found the Southern Christian Leadership Conference (SCLC) in 1957, serving as its first president. King’s efforts led to the 1963 March on Washington, where King delivered his “I Have a Dream” speech.He is best known for his role in the advancement of civil rights using nonviolent civil disobedience. Paul White has been elected to the Board of the American Overseas Memorial Day Association. The AOMDA http://aomda.com is responsible for the annual placement of American flags on all know graves in europe of American Service persons and the coordination of annual Memorial Day ceremonies at American Military cemeteries in Belgium, France, Holland, Italy, Luxembourg, Tunisia, and the United Kingdom with support from American Embassies, Consulates, The American Battle Monuments Commission and American Legion Posts and local groups. See video below for the latest HRG historical happening in Bony, France this past Memorial Day. Paul White founder of HRG had the honor to speak (en Francais) at the Somme American Military Cemetery Memorial Day ceremony in Bony, France. As part of the overall American Overseas Memorial Day Association (AOMDA) program, Paul honored all veterans and American soldiers who gave their lives in defense of freedom and liberty and are buried overseas. HRG founder Paul White to speak on behalf of over 100,000 American military servicemen who fought and died for freedom and are buried in American Military cemeteries throughout Europe.